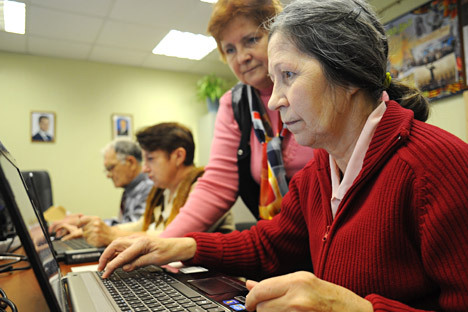 Volunteers from Moscow are training senior citizens on how to be part of the online community. VNUK volunteers approach every student patiently and try to explain in a simple way how to perform the task of the day’s lesson, which is to create an email mailbox. The grandmothers diligently record everything in their notebooks. For Lyudmila Dmitrievna, that is the name of my companion, this lesson is not her first. She has a valid mailbox, although she hasn’t yet fully mastered how to view messages, especially if they contain attachments. Dmitrievna is a retired cardiologist. Her children are adults and live separately. She needs a computer primarily to watch the Culture channel (if she unable to watch a program on TV) and learn foreign languages. "I always dreamed of philology. M teacher was a noblewoman who taught us perfect French. I have abilities for this, I would have done it, but it happened that I became a doctor. And I would like to learn English. With a program called Polyglot, which is led by Dmitry Petrov, I began my acquaintance with the computer. I realized that it was not an empty box," she said. I catch myself thinking that we often treat the elderly protectively: they grumble, they cannot send SMS, do not know how to use e-mails. They are helpless on Skype, closed in their infinitely little world, where there are large dusty chairs and bookshelves. "That still infuriates me terribly, I do not understand half the words that youths say, and they interrupt my thoughts,” Dmitrievna said. “All these blog, tweet, Like, and nickname words ... I cannot allow myself to feel as a second grader." I say nothing in response. We have somehow forgotten about the computer and the monitor falls asleep during our conversation. "Old people are terribly proud.” Dmitrievna continued. “They will not beg. And the grandchildren, they just say, "Grandma, you will not understand anything, I have no time. And why do you need it?" At the VNUK trainings volunteers answer this question this way: Seniors need to learn the Internet to use banking services and to not stand in line, to call for their children for free, to write friends on social networks, to watch the news and programs. "If I would only have time to do what's important before I pass away,” Dmitrievna said. “To learn a language. To finish. To read up. To listen." "Social networks help to deal with loneliness, all people become closer, at a distance of one mouse click ,” I tell her and turn on the computer, opening a Facebook page. "First, you need to have something to say,” Dmitrievna responded. “The computer is a good tool, useful, but it should be taken wisely. Once a young cousin came to me. He has never been to Moscow. He owns a computer but he doesn’t know who Lomonosov is. He is a second year student, among other things. I took him to the Tretyakov Museum, but he rushed back to his computer. He met a girl there. Love is unearthly. They met, but the girl didn’t want to meet again. He puts the computer aside. Love is very strong. Though I do not understand this. He didn’t see life but does not want to watch! So what about dependency? It is true, especially concerning the young. But when they say the computer only dries the brain, it is also a backward position." Maria Razbakova, the coordinator of volunteers, calls for the training session to wrap up. “Our lesson comes to an end, are there any questions left?" "Oh, it is the end already! And will you come next time?” Dmitrievna asked me. Suddenly I understand that here it is, her social network - personal contacts with people over a cup of tea. Of course, for the majority of the participants, connection with children is the first task that can be solved with a computer. "My daughter went to Canada, I have three grandchildren who were born there,” says another trainee. “I want to see my grandchildren at least on Skype! And they see me, they know that they have a grandmother." These two worlds adjust to each other and find a point of intersection, because grandmothers are able to master Twitter. Yes, it can be represented by short sentences, and they don’t care about gambling “Likes” counting. They forget about the monitor when they have an audience to listen.